The Chinese artist and provocateur Ai Weiwei (right) in Alison Klayman’s documentary about his activist life. Remember Tank Man? The unknown Chinese protester who stalled a line of armored vehicles during the 1989 crackdown in Tiananmen Square? What he was to those tanks, the artist-provocateur Ai Weiwei is to the entire Chinese government: a solitary figure who simply will not back down. Alison Klayman’s documentary is one of the most engagingly powerful movies of the year almost completely on the strength of Ai’s rumpled charisma and the confusion it creates in the bureaucratic mindset of the Chinese Communist Party. A big, burly bear of a man, with a caustic sense of humor behind deadpan eyes, he’s a culture jammer who began as an artist with political tendencies but has become an activist who happens to make art. The film captures the events of 2010 and early 2011, when Ai’s stubborn insistence on being heard — on the right of every Chinese man and woman to be heard — was gathering force and making him an icon both in China and internationally. The artist had already stirred the pot before the 2008 Summer Olympics, when he designed the famous “Bird’s Nest” stadium in Beijing only to disparage the upcoming event itself as PRC propaganda. The May 2008 Sichuan earthquake radicalized him further, and when “Never Sorry” opens, Ai is completing his project to compile a list of more than 5,000 children who died in poorly constructed government schools. He posts the list on his blog; the government shuts it down. He turns to Twitter, wielding the app like an aphoristic rapier. When he travels to Chengdu to testify at the trial of a fellow activist the police break into his hotel room at night and beat him. 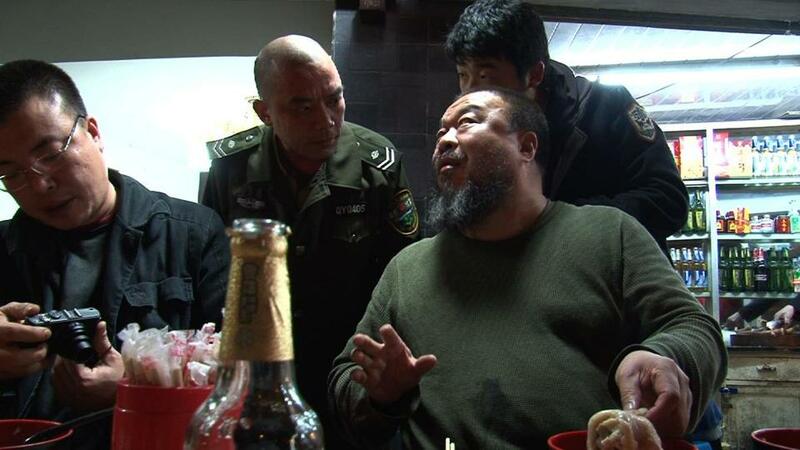 Here’s what makes Ai Weiwei different from other gadflies, though: He films everything. The video of the Chengdu attack is astonishing not for what we see — most of it takes place in the dark — but what we hear: the police at the door repeatedly demanding entrance and Ai just as repeatedly demanding to know why, for whom, by what right. A gathering at an outdoor restaurant later in the film is totalitarianism as farce, Ai’s videographer videotaping the cop who’s videotaping Ai. Every encounter with authority is charged with institutional menace on one side and on the other by a coolly comic certainty that’s awe-inspiring. The tools of state intimidation just don’t work with this man. The film delves into Ai’s upbringing — he’s the son of Ai Qing, a trailblazing modernist poet who fell victim to the Cultural Revolution — and his decade in the punky art scenes of 1980s Manhattan. We get glimpses of a personal life both traditionally bohemian (he has a wife and a girlfriend, with a young son by the latter) and charmingly average (his mom worries about him a lot). And we get a tour of a body of work that is breathtaking in its ability to communicate resistance in visual terms. Much of Ai’s art is defiant: a photo of Tiananmen Square with his outstretched arm flipping the bird in the foreground is startling for both its immediacy and its audacity. Director Alison Klayman found a portrait of contemporary China in avant-garde artist and political dissident Ai Weiwei. Other art pieces force a mystical communion with China’s people and history (as opposed to its government). For a show in Munich, Ai covered the museum’s outer walls with a mural of color-coded children’s backpacks that spelled out a Sichuan mother’s remembrance of her dead daughter (“She lived happily for seven years”). At the Tate Modern, he fills a huge gallery with a floor of hand-painted porcelain sunflower seeds, inviting museumgoers to cross it in bare feet and think about the power of anonymous millions. He paints a Coca-Cola logo on an authentic Han vase to protest his country’s prostitution of its historic art. He’s right. Late in “Never Sorry,” in April 2011, Ai is arrested and detained for several months. Upon his release, he is handed a tax bill for $2.4 million and forbidden to leave China for a year. In video footage after his release, he is clearly rattled by what he experienced while being held. “Maybe being powerful is to be fragile,” he says. The transformation is complete: Ai’s his own artwork now, standing in for all his countrymen, and he has never seemed more human. This story is far from over.